Captive State Movie Clip https://teaser-trailer.com/movie/captive-state/ science-fiction thriller movie starring John Goodman, Vera Farmiga, Jonathan Majors, Ashton Sanders, Alan Ruck, Madeline Brewer, Ben Daniels, Kevin J.
O’Connor, KiKi Layne, Ta’Rhonda Jones, Kevin Dunn, D.B. 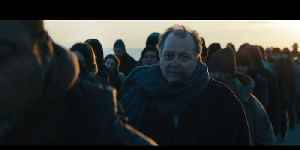 Captive State movie clip https://teaser-trailer.com/movie/captive-state/ Set in a Chicago neighborhood nearly a decade after an occupation by an extra-terrestrial force, Captive State explores the..
Captive State Movie Clip HD https://teaser-trailer.com/movie/captive-state/ - science-fiction thriller movie directed by Rupert Wyatt and starring John Goodman, Vera Farmiga, Jonathan Majors, Ashton.. In this clip from 'Captive State', called "Light A Match Ignite A War", Ashton Sanders has to make a choice.